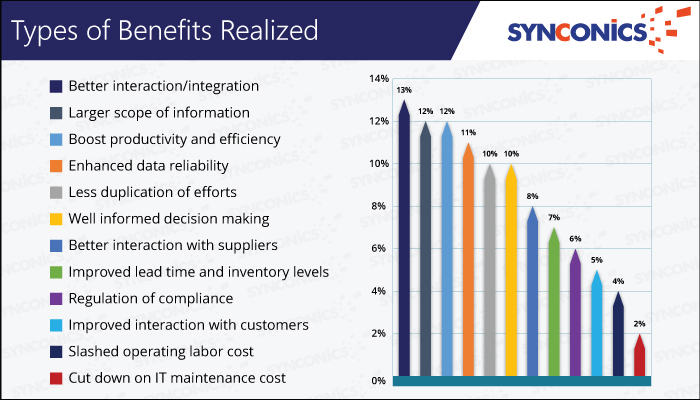 Synconics Odoo ERP Report | | Synconics Technologies Pvt. Ltd.
Synconics Technologies Pvt. Ltd. has developed Odoo ERP Report 2017. 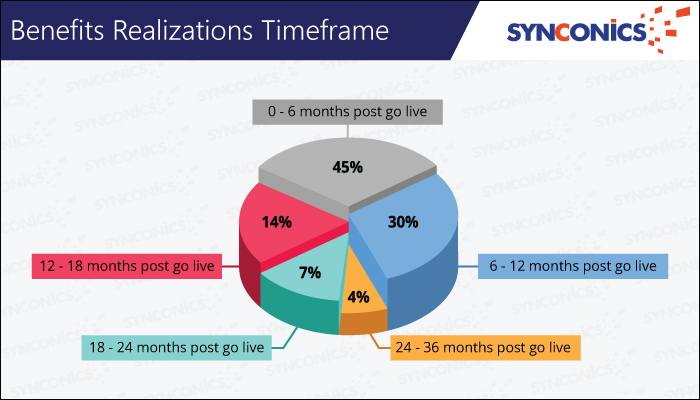 This report summarizes Synconics’ independent research between April 2016 to March 2017 from experience of our collective 150+ customers leads, inquiry and true deployment with regard to overall implementations and satisfaction; keeping in mind organisation size, industries and geographic locations. Apart from analyzing type of companies using ERP, we have also analyzed why do we need ERP. 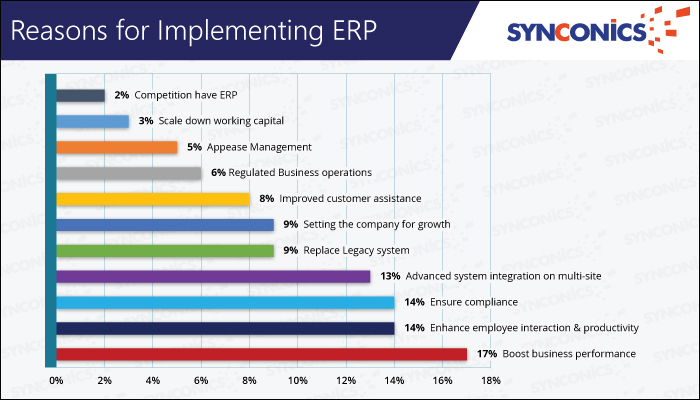 Invariably the most substantial reason for companies to implement ERP is practically to stay in competition. Without a comprehensive system it is impossible to stay competitive. 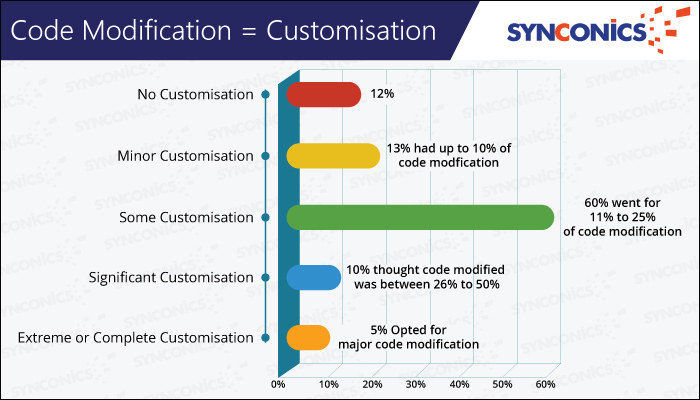 In our report we have also covered customisation and its percentage. customisation depends on how companies positions its strategic business issue and integrates it with a process redesign effort, which is more likely to succeed ERP implementation. In our report we have pointed out benefits realization time-frame, which can ensure a successful implementation. 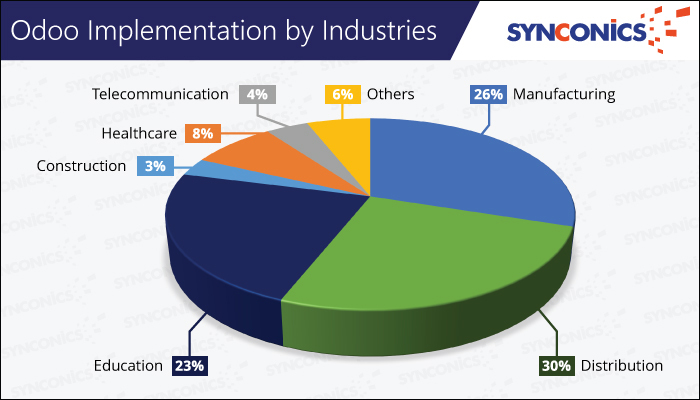 Synconics has served companies from different industry verticals. Of the customers we had in this period, 30% of our customers were distribution company or companies with their distribution department who opted for Odoo. Please refer the graph for more details. This includes projects for small-medium sized companies, where limited customisation was needed. With ERP applications, business activities and company performance can be better monitored and controlled. It is a given fact that one of the biggest reasons to implement ERP solution is to create a common IT platform across the company. Odoo’s modern ERP solutions allows a great degree of flexibility without custom code. This type of solution gives the best of both worlds – a highly tailored experience, without specialized code that will keep you from changing processes or upgrading. In terms of product, Odoo is going way beyond traditional ERP. The Odoo solution is ideal for SMEs, but fits both small and large companies alike. It may be helpful to begin with the most basic systems and then expand to other functional areas. 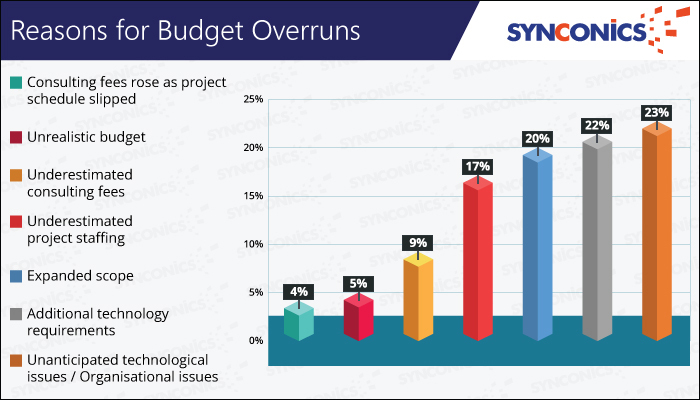 Synconics also suggests using change management techniques to manage the human dimension of the project, since ERP requires a great deal of support from affected areas of the company. Finally, we emphasizes that once the ERP system is in place, companies need to interpret the data collected carefully and accurately if the system is to contribute to business planning. The crux of any software is how much it meets the business requirements rather providing the existing features to the company with standard processes. With customisation, many companies have given life to their work process. As the system is customised with their requirement more likability, productivity and efficiency is increased tenfolds. As per our survey only 12% use Odoo pure vanilla without customisation, but as evident from the graph businesses do need some sort of customisation. We have done customisation on almost every module. No two business would operate the same way and also it would be really hard to get an entire business system that fulfills their business flow. As such Odoo being highly flexible is gaining ground rapidly. The implementation process also served as an opportunity to simplify and restructure business operations to industry best practices built into the ERP system. BPM results systematic approach in making an organisation’s workflow more effective, more efficient and more capable of adapting to an ever-changing environment. 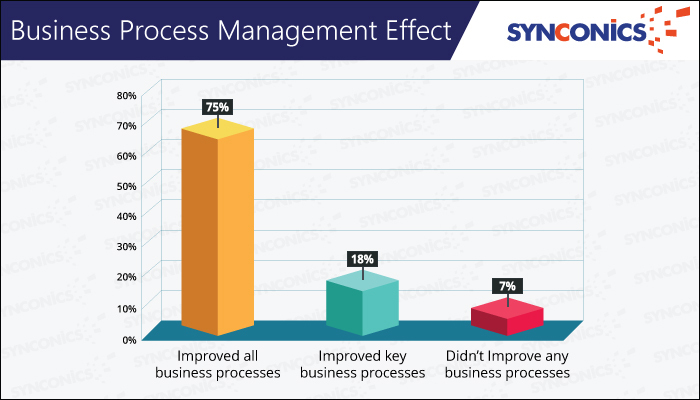 Here in our survey 75% agreed to have overall improvement in their collective business processes. 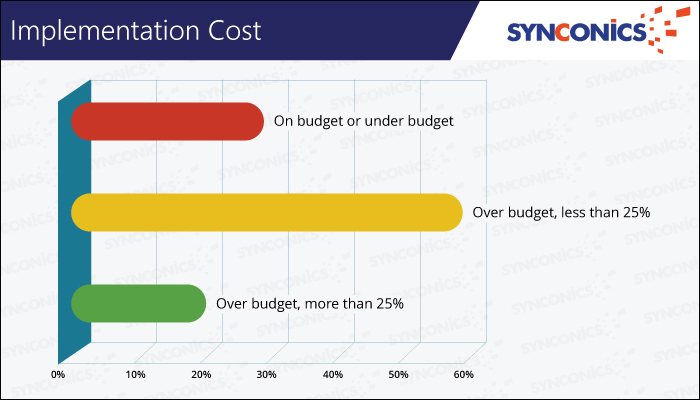 According to our experience and as answered by some clients, on average organisations spend 3.6% of their annual revenue on their project implementation. 13% of companies had over-run their project by 25% while 26% were on budget or were under budget. It can be extremely difficult to try and hash out an accurate or precise budget and calendar for an ERP project, and even harder to justify your initial estimates to the stake holders. The amount of complex factors, time and technology that is involved in an ERP implementation, amount to being one of the major reasons so many modern ERP implementations still seem to go over budget and take months beyond their scheduled go-live date to actually complete. We have observed that though implementation had been finalized by decision makers on client’s end, it didn’t take into account some underlying aspects that are involved in this crucial process. One needs to consider the cost of customisations that will be needed to adapt Odoo for individual businesses. As evident in the representation here 23% companies had unanticipated technical/organisational issue. So they think that there has been a budget overrun but in reality they had not done proper gap analysis or business process re-engineering. Had they availed some Odoo training they would have better aligned their business flow with existing features of Odoo. They should be willing to make some adjustments in their flow or be ready for customisation. Benefits realization in implementation is the process of ensuring benefits are identified, defined, linked to strategic outcomes and delivered. Just as we plan on a schedule for implementation, there also has to be a plan when and what you expect the benefits to appear. Here we see in our presentation that 4% didn’t have any measurable benefits – could this be a reason that they didn’t plan on what benefits that anticipated by implementing? On the other hand we observed that 11% project managers who had planned better reported up to 80 to 100% benefit. Before any implementation delivers something there are just the prediction that there will be benefits. Realizing the benefits means making them real i.e. actually getting the benefits. One can’t realize the benefits before an implementation has been in place. While some processes may take longer before distinct results are visible, there will always be some deliverables which will have benefits immediately. ERP software is very complex and tailored to the needs of businesses. The configuration, upgrades, reporting customisations, business process modifications, hosting, backups, and other complexities are often more expensive than the underlying software. For this reason, the cost benefits of implementing Odoo in the beginning may seem smaller than they would be for simpler applications such as email or website creation software. So to represent the Benefits Realizations we have considered a larger time-frame, extending it with our previous clients’ feedback. 45% have benefited most when they have got Odoo ERP system live within 0-6 months. Organisations who choose to utilize ERP systems aims to combine all company functions such as sales, marketing, and manufacturing. The output of such functions are massive amounts of data which managers utilize to effectively accomplish such critical organisational tasks as human resource management, customer service, financing, and inventory management. Types of benefits vary but here is what we found on our survey, as shown in graph 13% responded that they feel better to interact now as they have access to data post implementation which earlier was only confined to top management. Also 12% said that scope of information has increased and this results in better productivity and efficiency (another 12%). As evident ERP systems are far more complicated than the conventional software package due to the reengineering demanded by ERP of the entire organisation. ERP implementations require extensive interdepartmental coordination which adds to the complexity of ERP implementation. As a result, we conclude that the support of management and the execution of the project become very critical to the success of ERP implementation. 1. By investing in Organisational Change Management businesses are cultivating not only acceptance, but support, which is a necessary component for successfully managing nearly any change within a business. In comparison to last year, more organisations reported a strong focus on change management. The ERP implementation is more likely to succeed if the company positions it as a strategic business issue and integrates it with a process redesign effort. 2. Business Process Management – Before implementing ERP, companies need to re-organise their business process or restructure. Putting a system on top of inefficient processes is futile and more organisations seem to be realizing it. 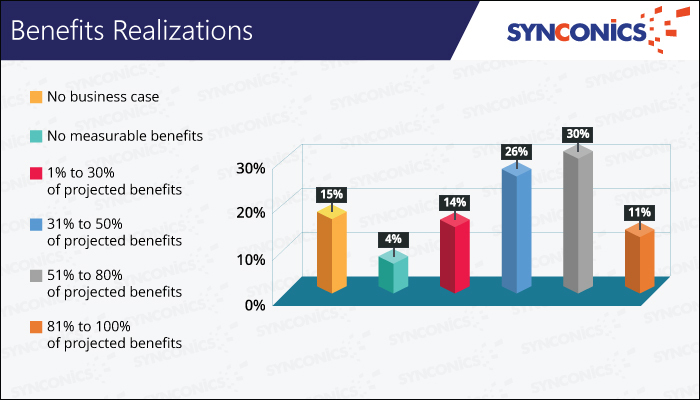 Benefits realization is co-related to process improvement, which is reflected in the decreasing number of organisations reporting zero business benefits. 3. Always Measure Results – For any organisation it is important to scale business process, for the benefit of the company or for the employee who has developed a business case and presented it to higher executives the ROI achieved and define key performance indicators or if your project was worth the effort. The increasing number of organisations saying they did not develop a business case accompanied by the increase in budget overruns is no coincidence. While each organisation has unique variables that determine the time, money and resources required for success, there are no exceptions when it comes to organisational change and business process management – every organisation needs at least a moderate focus on these two success factors. Invariably the most substantial reason for companies to implement ERP is that without it, staying competitive is a practical impossibility.